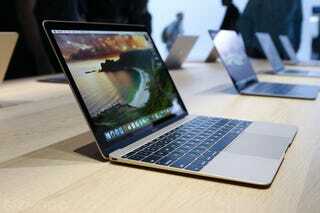 Apple's new MacBook is slick and svelte. It only weighs two pounds! But before you get too excited about how well this tiny (gold) laptop might fit into your life, you should know a little bit about its brains. This is not a retina MacBook Air. The new MacBook has Intel's Core M inside. Core M is one part laptop—like the Core I processors you'll find in a MacBook Air or MacBook Pro. But it's also one part tablet—like the Intel Atom processors you'll find in Windows tablets and other gadgets that are way more phone than computer. Core M is where these two meet in the middle. So while the new MacBook is lighter and slimmer and sleeker than any Apple laptop you've ever seen, that's because it's not quite a do-it-all workhorse in the way that MacBooks have historically been. It has a screen and a keyboard, sure. But it's only as slim as it is because it has a smaller engine driving it. It's tempting to imagine, but Apple didn't just squeeze a MacBook Air into a smaller body with black magic or something, and Core M means the new MacBook is going to be the least powerful in the line-up, full stop. Especially considering that with its high-res screen, the new MacBook has some serious pixels to push. We've seen similar laptops like the Yoga Pro 3 (Core M processor, slightly higher-res screen) come up waaaaaaay short of what you'd expect out of a laptop, not to mention that that slim design really cuts down on the ports you might want. The new MacBook isn't just an iPad with a keyboard, but it is a step in that direction. But it's not all bad! I mean just look at the new MacBook; a body that small and light is impossible with more powerful chips that require fans to keep them cool. And when you have a processor that uses less power, it also makes better use of its battery. We'll have to test it in person, but chances are the new MacBook has startlingly decent battery life for how light it is. You can hold it in one hand. It looks to be an amazing machine if you don't need tons of power. So maybe there's room for in your life for a gadget like that. If you travel constantly and bang out a lot of emails, the weight trade-off could be super worth it. But there is a trade-off. One that the MacBook name doesn't necessarily make clear, and one that skinny Windows laptops like the Dell XPS 13 and Surface Pro 3 prove you don't have to live with. We'll have to see what this undoubtedly beautiful machine is like in practice. But make no mistake: This isn't the retina MacBook Air you were hoping for.